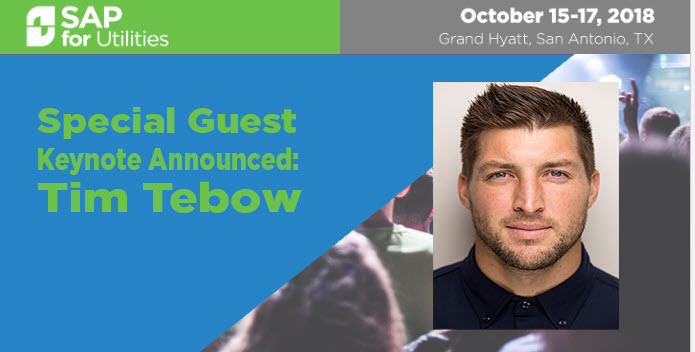 Tim Tebow is the highly anticipated SAP for Utilities 2018 special guest speaker! Join two-time national champion, first-round NFL draft pick and Heisman Trophy winner, Tim Tebow for a Q&A style keynote on Tuesday, October 16. Hear his insights into leadership and teamwork as he draws on his experience playing in the NFL for the Denver Broncos, New York Jets and New England Patriots. Plus, hear his perceptive on creating and driving community service projects from his work with the Tim Tebow Foundation. We look forward to connecting with you in San Antonio at the 11th annual event! We hope to see everyone at the SAP for Utilities event Oct 15-17th in San Antonio. It’s not too late to make it to this year’s conference in San Antonio, October 15-17, 2018. This is our premier event for all utilities. Check out this great agenda. The ASUG Utility SIG volunteers look forward to reconnecting with many of you and meeting some of you for the first time. Be sure to come to the Monday, October 15th, ASUG Jump Start meeting from 3:30 pm – 5:00 pm. We will have roadmaps and everything you need to have a great conference. Sue Daulton, our ASUG Community Facilitator will be there to share an update on our ASUG SIG group and hear from you about what you’d like to see in the coming year. Stefan Wolf will be the new acting Head of IBU Utilities. He takes over from Henry Bailey, who has decided to retire early for personal reasons and plans his next venture. We wish Henry all the best for his future. Stefan has been working in the utilities industry for 28 years and will build on the outstanding work that has been done under Henry’s leadership. The outcomes of our Utility Customer Connection were announced today, September 26th. Click here to see the 15 new enhancements listed on the SAP Customer Influence site that will be delivered in the ISU solution in the next service packs. Slides from the presentation will be posted https://discuss.asug.com/community/sig_communities/utilities_industry. The C/4 HANA team has made a name change for what was Hybris Billing back to the original BRIM – Billing & Revenue Innovation Management. Take a look at BRIM if you need to consolidate the many different utility billing use cases you have for something other than consumptive billing. Other utilities are live using BRIM to create billing documents which are then interfaced to their existing Consumptive Billing ISU solutions. BRIM is an on premise solution that interfaces to ISU. Learning C/4 HANA Portal Launched – Click Here to learn C/4 HANA – All Free Training Content now on a single Portal. SAP is looking for utilities to collaborate in building a set of customer service chatbots. Automating Customer Service with chatbots can bring a significant and rapid ROI to your organization. Better user experience, higher productivity. To bring this value to your organization and customers SAP is asking interested utilities to co-innovate with SAP. Share conversation transcripts, and they will help you build your customer service chatbot.” Please e-mail ml at sap dot com to start this exciting collaboration.